Thank you, your registration is complete. An email has been sent to your registered email address. You have logged in successfully. Complete your look with your favorite color and your choice of extras. 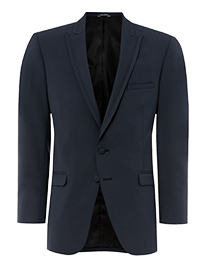 Allure Men’s fashion-forward shade of Slate Blue is unexpected and ultra-elegant, crafted in a superfine wool blend. The single-breasted, 2-button, side-vented coat features a peak collar with a self-fabric inset on the lapel rather than satin, for an understated and less formal look, and straight flap pockets. Matching pants and a white shirt are included in your rental. Do you want a tie or a bowtie? Do you want a vest or cummerbund? Would you like to add shoes to your rental for $20.00? $70.00 discount has already been applied.